Beads are often used for creating designs inside vases at wedding receptions, parties and at home. The only type of craft bead available in the market today that can be dehydrated is the water bead. 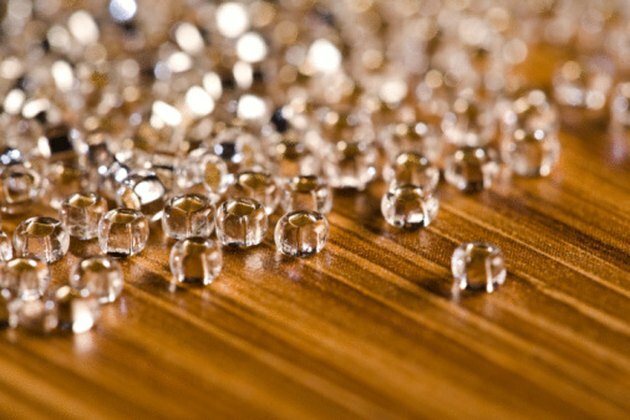 Water beads are sold in small packets and are tiny, round beads made from a water absorbing polymer. They are available in a vast array of colors and can be used to decorate vases or any other item that can hold them. Water beads plump up when water is poured on them and look like glass marbles. You can dehydrate your beads and store them for future use. Dehydrate beads for easy storage. Pour the water beads out of their container. If there is water in the container, use a strainer to separate the beads from the water. Place the beads on top of a nonstick pan or sheet. Space out the beads on your nonstick surface, as you want to prevent them from sticking to each other during dehydration. Place the beads in an exposed area, like a window sill, to speed up the dehydration process. Turn the dehydrating beads over every day to help all sides dehydrate at an equal rate. Store the beads in a zip-close storage bag once they return to their original, tiny size. The entire dehydration process should take four days, at most, to complete. Elle Cordero began writing professionally in 2010. She enjoys writing about social issues in a savvy and intelligent style. Her areas of expertise include finance and investment issues. Cordero received her Bachelor of Arts in economics from the University of Chicago.